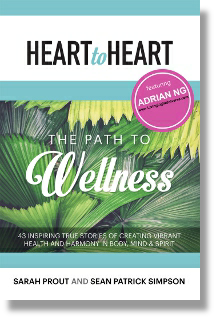 “Heart to Heart: The Path to Wellness” is an extraordinary collection of true-life experiences written from the hearts and minds of more than 40 inspiring authors. We created this book because we know there are many journeys for the mind, body, and spirit, and so many life lessons for us to explore, heal, and grow from. Adrian Ng (Psychic, Master Healer Trainer & Life Guide) is a co-author of this inspiring book that has just been released in January 2015. More than 40 Bestselling Authors, Life Coaches, Healers and Doctors worldwide including Dr John Demartini and Bob Doyle from the International Bestseller “The Secret” book and movie share their true-life stories and valuable advice. It can help anyone wanting to achieve health and life wellness, no matter how difficult their circumstances are. Contact us to purchase it. Please email us with your Name and Shipping Address. We will inform you of the mailing and shipping charges for your location. I have received kind advice as well as added values from him which was well beyond expectation. Many thanks to you Adrian! I Recommend this Akashic reading to anyone that seeks information and answers that no one else can answer it or Have tried all means. I personally have Tried asking Chinese Gods Temple Mediums and Other kind of Healers. For a limited period only, you will receive a free copy of this uplifting book, if you sign up for our Kundalini Reiki Level 1 Healing Course.